Bought my washer at Sears, after much searching for the perfect washer for me. I've had it about 5 years, it was to replace another kenmore product that had seen much better days. The machine was delivered on time, that was a change. They were careful not to damage the washer or anything else, nice not to have to worry about that. Why did I pick this model? 2 reasons, one it's a front load, and they do a much better job of washing clothes, second they use WAY less water to wash the same clothes! 15 gallons per load instead of the 45 for a top load! The water savings alone made this machine worth the investment! I would HIGHLY recomment this machine, and have several times! I do 2 loads a week and it fits ALL the dirty clothes. My water bill dropped $10 a month just by using it. I extra high spin makes your clothes almost dry before they go in the dryer, so you save wear and tear on it too, not to mention the cost of power for running drying for extended time because your clothes are still dripping wet! I'd like to copy/paste everything of the above excluding the positive comments. I paid top dollar for both the H3 dryer and washer. My washer started the Suds and then F5 code. Suds wasn't the problem so I checked all the hoses and they were clear. Next replaced the Sensor just because that was the next suggested problem. Nothing.. still got the F35. Cleaned the trap, ran vinegar through the machine. nothing. Call Sears pay $80 for him to walk through the door. I have to tell him how to run the diagnostic tests. He does nothing but check the trap and shakes a few wires and says it's you Mother board and that total will cost $729. I replied this machine is only 5 years old. No.. not doing it.I'll buy a less expensive brand new washer for $500 and then if I have a problem I'll replace the washer again. No more top of the line for me.. that is ridiculous. Am I the only one that after the computer board repairs have had to replace 3 bellow seals per year for the past 5 years at $100 per seal? Real nice on the new hardwood floors too!!! Bought my machine in 2003 with matching dryer. This machine has worked great. Replaced two shocks as the drum shifted when they were lifted tiped sideways when moved. Clothes come out clean and no other problems with electronics. I do regular maintenance on both washer and dryer keep them waxed outside to keep them clean. Always careful not to spill liquids on panel and wipe down inside.They have been used for 12yrs. Never a maintenance call. Kenmore should stand behind their product! I'd like to begin with "Rate This Page": This blog page 5 stars, the Kenmore Elite HE3t gets -5! I've had the Kenmore Ht3 since 2008. I'm single and live alone, so not so much laundry is run compared to a more than one person household. About 8 months ago I had to begin troubleshooting my washer. It smells like sewage when it's running, especially a hot load. Care requires leaving the door open between washing periods, running the clean washer mode 1x per week, and taking the hoses off to clean every quarter. This wastes so much time! I've never had a washer that required this type of maintenance! My previous top load Kenmore washer lasted 20 plus years. This machine does not clean my clothes and I often have to clean cycle it and then run 2 loads and clean cycle it again. Today all the hoses came off and were cleaned as the sewage smell was horrible! It had only been a month but build up was apparent in the water hoses exiting the machine. The water pump is being tested with a load being run after everything was cleaned out. Hopefully that is not a new issue. I would strongly recommend not purchasing from Kenmore. They do not stand behind their engineering solutions and don't work with you to reasonably resolve issues that are clearly an engineering fault. I personally will never purchase a Kenmore appliance again! Features are abundant, and - at any point in our ownership - we've used them all. I can't begin to understand the severely negative comments on the product. We don't do anything special or extraordinary with the washer (or dryer). We simply follow the owner's manual and do our thing. Very pleased to own the matching washer/dryer set. Strongly recommend, for performance - ease of use - economy. We've saved a ton on washing products and water. The machine is a complete piece of junk constantly breaking down , with the previously stated repair delays . I will not buy Sears appliances again . It worked for about 7 years, after owning the older stlys for over 17to uears youd think these would run better. After the last time it wouldn't work we bought a Samsung, cant keep dumpong money into it. If you search the name of this you'll see mant others have the same problem! Had a $300 Kenmore washer that was 17 years old when we sold it with our house. Bought the Kenmore Elite HE3t in 2003 with matching dryer to save space and energy. Figured the $300 one lasted 17 years this one should do just as good. Last year was a $600 repair, main motor, control board and water pump. This year the rear bearing. called Sears to get the outer tub they told me they would send one out after a 3 hour run around on the phone. gave me an order number and told me I would have it in 3 to 5 business days. Checked the order 2 days later and it came up as "No order found". Another 3 hours on the phone and I was told only a Sears Technician can order that part and it would cost $129 for them to come out to diagnose it. Only problem is I was expecting the part and had already taken the machine apart, now they won't touch it and I still cannot get the part on warranty. They did offer to charge me to reassemble the washer so they could diagnose the broken bearing that can be plainly seen now that it is out of the machine. I guess you can't truly tell if the bearing is bad visually you have to run the diagnostics so you can hear it be bad as well. Unless you enjoy being frustrated, wasting time, and money avoid this and all Sears products. We bought ours 4 years ago and it breaks down about 5 or 6 times a year. It takes days to reset after a malfunction and we have to constantly drain it from the bottom because of the poorly consructed drain system. The clothes often come out smelly and you must purchase a special soap to clean out the machine once a month. We spent alot of money on this machine, yet we find ourselves at the laundromat quite often. I will never buy anything that says Kenmore on it again. Our 10 year old top loader was far more reliable than this peice of garbage, I'm sorry I gave it away. It is not worth the few dollars you save on water. I have finally had enough and am going to find another top loader. I can probably find something at a yard sale that works better than this. My HE 3t will only work when it is unplugged and plugged back in. It gets stuck in mid cycle and won't drain. It is loud and smelly. This machine is JUNK! And by the way...so is my Kenmore Elite Refrig...Don't let the name fool you...There is NOTHING ELITE about either of them! After 7 years, our HE3 washer also officially died. Stainless drum is detached from the plastic outer tub, and when I took off the back of the machine, found a brownish substance leaking from the back of the outer tub, a couple small metal balls (presumably from the bearings) and a ton of metal shavings. When you spend over $1,000 on a washing machine, you expect it to last more than 7 years. Although, I guess I should be glad ours lasted this long, because I've read countless peoples' stories about how theirs died much sooner. Not buying a thing from Sears again. In fact, I'm calling to cancel our credit card now. I'll be getting a top-loader tomorrow from a local reputable company that stands by their products and knows the definition of "customer service." I have had the Kenmore HE3t since May 2003. It worked well while it was still in its five year warranty. A bit later it starts making the infamous shaking and very loud spin cycles. Figuring it was the bearings, I thought I would just let it wear itself out. That went on maybe two years until last month the tub began to seize up a bit. At that point, I decided it was time to take a look inside just to see how bad it was. Turns out the pulley that drives the tub had been wearing out on the drive shaft and had created quite a wobble. I ordered the $45 pulley and a new belt while I was at it, put it back together and WOW, just like new. I wonder how many others believe also the bearings are going out when they actually aren't the culprit? If your Kenmore Elite sounds like a jet airliner taking off then it is time for new bearings and seal... See www.elitebearing.com for more information on how to save lots of money and extend the life of your Elite front loader! This is the WORST product I have ever owned. If I could, I would put it on the curb with a FREE sign on it!!!!!! Then again I wouldn't want someone to have to stand there for countless hours a day to fool around with their washer to get it to work. I have three young kids and do not have the time to stand around waiting for my washer to decide to work. It always says SUD or F35. Piece of JUNK!!!!!!! Don't buy this product or any other Whirlpool product from SEARS. Bought this machine about 7 years ago and have had LOTS of problems. The machine's favorite is the error code HF (water flow). Initially I thought it was the water pressure at my house, but I continued to have problems after I moved. I have had at least 5 service calls to look at the error code (which never produced the error in front of a tech.) I was told it was probably a computer error and that it would be a $300 part to replace, not including labor. I have also had at least 2 service calls due to a stuck water valve that lets water leak in after the load is done. (Which could have potentially flooded the house.) I've also had problems with water draining/spinning...and yes 2 more service calls for that issue as well. I've recently adopted a "wait and see" approach with the repairs, because waiting a couple of days often seems to eliminate the problem, at least temporarily. I haven't replaced the water valve recently...whenever I have the problem I close the door and manually drain the machine....and usually within a few days it is working properly again. My question: For the amount of money spent on this machine, should I really have to deal with this? Kenmore is the same as Whirlpool....they just put a different badge on it. Hard to say which brand to trust, but I will be looking for a new one soon....and WILL NOT EVEN STOP BY SEARS. This machine has been a huge headache and it's only 2 years old. It doesn't even deserve one star. There should be ZERO stars offered. Sears should recall it if they have any dignity or care at all about thier consumers. For all the loads I have had to do over and over and over because of error codes or because the clothes were not clean-----I am WASTING MORE WATER THAN MY OLD SCHOOL WASHER. This is NOT an energy saving machine. It should NOT have been an "energy star" appliance. Sears owes a lot of hard working people some answers and some apologies. I will never buy anything again from Sears/Kenmore/Whirlpool again unless this happens!!!!! had my machine two years. It started sounding like and airliner was landing in my living room. I read that the bearings go out. So, i took it apart and found that the inner and outer bearings were broken and rusted. Sears parts doesn't sell replacement bearings, you have to buy a new $337 tub!!!! The tub carries a 10 y warranty but to access that you have to pay $170 service call fee and hope the technician says its a manufactures defect. Elite HE3t, broke after 2 years! $950 to fix after only two years of NORMAL washing. Rear bearing is worn out. NO MORE SEARS STUFF FOR THIS FAMILY! JUNK JUNK JUNK! If you or someone in your household is some what handy it is fixable. There are no gears to wear out on the drum when it spins. I had the same problem and went on line, learned that the brackets that hold the drum to the washer will corrode they are just aluminum. The whole drum does need to be replaced, but my friend and myself were able to do it. Just remember how it comes apart. I really liked this washer at first even though it sounds like an airplane taking off when it spins. It tangles up the jeans when they are washed. Socks get caught in the gasket and plug up the drain. You can't use much soap and every time I wash the kids clothes I get an error message. We have had it for seven years and the gears on the back are worn out that spin the drum. It will cost more to fix it than to get a new washer. I am very disappointed that it didn't last a long time like older models. I have a kenmore elite HE3 and I hate it! It keeps giving me the code F2 and I would like to say to Sears, FU . It won't finish the cycle, fills up with water and won't drain, it shakes my whole house when it does work. It is the worst washing machine I ever had. We purchased in 07, thank goodness I went for the extended warranty. this machine has stolen soo much time from me and my busy days. It turns on and off all by its self so we have to unplug it at night and if we are away from house. Sometimes it just won't turn on at all, nothing happens as if it finally died, then perhaps a minute or perhaps a day later it turns on! We even went as far as having a new breaker and electrical ran so it's on its very own line. Soap is not an issue and sears repair has confirmed this on several occassions, they just come out, get it to turn on and say,"I can't do anything because it's working fine, so call us again when it stops." I have all paper work for more than 1 dozen visits. Very dissapointed in Sears and the service I have received. I am convinced that F35 Error and SUDs error are the result of a faulty analog pressure switch and SEARS AS WELL AS WHIRLPOOL KNOW IT! I say they know because they have to. This part is having to be replaced on numorous and fairly new machines. In fact you will find that it is always on backorder. I just had mine replaced (240.00) and was told it would take 3 weeks to get the part through Whirlpool. My repairman (not connected with Whirlpool or Sears) told me that I would not have another problem with this replacement switch because "most likely" Whirlpool has worked out the "problem" with it. WHAT? THERE'S A PROBLEM WITH THE PART? THEN WHY AM I PAYING THE BILL? He even said that Whirlpool probably wouldn't do a recall on it because of the expense involved but that it probably should be one. This problem can initially be overcome by unplugging and restarting the machine but it will get progressively worse and even that won't work and the part will have to be replaced. We spent about a year of our time on and off in the laundry room trying to get it to work before we replaced the part. Since I can't get my time back from Sears or Whirlpool, I would at least like my money back. The nerve of them pretending like they don't know what's wrong! Like everyone else on this sight I agree that this is one of the worst purchases that I have made. My wife and I foolishly thought that by buying a top-of-the line product, we would get top-of-the line service. How wrong we were. Within the first year we had to have some sensor replaced and if was not in warranty we would of had a bill to pay that was equal to half the cost of the machine! Not only that, but it took Sears forever to get someone out to make the repair. I've got trouble again SUD F35. Sound familiar? Please never, ever buy a major appliance from Sears. When i add bleach to the compartment, it immediately empties into the washer. I have removed the tray to clean it and nothing seems to be wrong. Anybody else have this problem???? It would take me too long to try and express my frustration with this washer. It began to fail withing the first 2 weeks of install... We had purchased all brand new stainless appliances for the kitchen and a new washer dryer at the same time from Sears. A TON of money. Needless to say I was upset when one by one, all of our appliances began to have problems. And I'm not talking small issues either. Sears service was horrible, although the techs did try everything they could. In the 3 years of owning it, it has been a tempermental, smelly, loud, stomping machine. I HATE it, and can't wait to replace it for good. Check the internet for the error code definitions, I have been able to get mine back up and running using some tricks. Good Luck to everybody else that has one- we need it! It also saves a lot of water. The regular top load washer uses about 60 gallons of water for a large load, this washer uses a max of 20 gallons for larger loads than my old top-loader. The He soap the machine uses very little soap, so a bottle of soap lasts twice as long now too. It does require a little more maintenence though. For example you have to run it through a special cleaning cycle once a month, and leave the door open when its not in use, or else it will get mold and buildup inside. It also has a tendency to vibrate sometimes, i guess just because it spins so fast. It's nothing I cant deal with though, the pros far outweigh the cons. 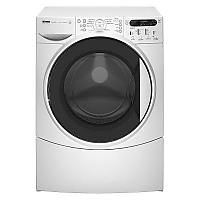 All in all, I think it is an absolutely wonderful washer, and I wouldnt think twice about recommending it to others. You can now repair your Kenmore Elite bearings with a special bearing and seal kit at http://www.elitebearing.com. By the way... Whirlpool makes the Kenmore Elites... So if you just purchased a Whirlpool I would expect problems in 5 years. Do not buy this machine unless you don't mind buying a new one in the next five years.. I purchased this machine in August of 2005 and to be honest I loved it and recommended it to several friends. However 3 weeks ago the drum came loose and would not go through the spin cycle. i assumed that it was the belt which in my mind was not big deal. When the Sears repairman arrived and had a look at the machine, it was determined that it was the housing that holds the drum in place. He phones Sears parts and the parts plus labour to replace them was $1100.00, excluding tax. He went on to says that Kmart purchased Sears in 2004 and that since that time Sears products that have been sold are junk. I arranged delivery of a Whirlpool front loader the very same day and my bill was $950.00...tax in with delivery and removal of the Sears piece of Junk. Please beware!!!! I have a problem with my Kenmore Elite HE 3t it is blinking DL,F what does that mean and how can I fix it so that I can do wash. Please help the manual dosn't give me the solution. I own the Kenmore Elite He 3t. This is a front loading washing machine. The detergent compartment is conveniently located at the top with individual dispensers for soap, bleach and fabric softener. The machine is a high energy and efficiency machine and uses a minimal amount of water which has also helped with not overflowing my cesspool. The Kenmore Elite He 3t also has a variety of settings on it that can handle everything from the normal day to day wash, sanitizing, heavy duty, express wash and delicates plus a few other settings. It also allows you to set the level of how dirty your laundry is so you can extend or decrease the length of time it will use to wash your clothes. The machine also offers a variety of water temperature settings if you really want to get into very particular washing recipes. I also purchased the extra shelf pedestal that the machine sits on which raises it off of the ground making it easier to load and unload your laundry, plus store your detergent. I do enjoy the machine when it is working. However the machine often breaks down and in the relatively short time that I have owned it (about 4 years) it has had to have its water pump replaced 4 times. Additionally, one day the door on the machine just locked and could not be opened. The mother board had inexplicably fried itself. No power surge, no lightening storm it just got fried. The mother board, and I have no idea what a mother board is, needed to be replaced. Thankfully I had purchased the long term service plan, and have faithfully renewed it each year since. If I did not get the service plan I would have paid for it 4 times over with the parts and service I have had. While the service plan has taken care of the repairs to fix the machine it has not covered the time and money I have had to spend going to laundromats while I wait for a few days for a technician to come to my home, and then a few more weeks while I wait for the parts to arrive and the technician to come back again to finish the repairs. I love this washer when it works. It offers a wide range of washing options to ensure that I am using the power, time and energy to clean my clothes as best as possible. My clothes always come out clean. Now the downside to this washing machine is that is often breaks down and I have to go for long periods of time without its use. I have had to wait for weeks on end to get service appointments, and then wait for parts to arrive and another appointment to install it. I usually do not complain but I feel I should warn othe consumers. Our Kenmore HE 3 elite is junk. Sears should go to jail for selling this crap to american consumers. I would not sell it to an Iraqui with aids. It is so bad and we have had dozens of problems never again Kenmore.. I absolutely hate my Kenmore Elite HE3t front load washer. It is only 2 years old and i have had nothing but problems with it. I keep getting a error code F2 which means I am using too much soap according to the manufacture. I use a half of teaspoon and it is HE detergent. I've tried different expensive brands and nothing works. Also it says a 45 min load which actually takes over and hour to complete.